Republicans, Democrats and the media have told Americans, the problem with our economy has been high unemployment and once unemployment decreases we will have economic growth. However, the statistics from the U.S. Census (2009 & 2010) Report - Income, Poverty, and Health Insurance Coverage challenge those conclusions. To substantiate Tami’s opinion, she has taken the key data and summarized the information into various graphs and tables, see below. She believes the data proves Republicans and Democrats have not accurately analyzed our economic statistics; thus putting the United States people and our economy at risk. The Distribution of U.S. Household Income, (Table 1) shows that our country has made significant gains in distribution of wealth. Most likely, the best in the World. The data illustrations that since 1969 America has reduced the percentage of households living in the under $15,000 income level, while increasing the percentage of the population living in the top four income groups. Therefore, those Americans which previously lived in the lower four income groups improved their household incomes as represented in Percent of Households and Distribution of Income (Graph 1). Please consider and question, why has the Government and the Media reported the data from a negative viewpoint – the crisis in America was the income gap between rich and poor? When in actuality, the data supports the conclusion that America has improved their distribution of wealth. However, cost of living negated those income gains, corroborated from the fact that in 2009 we had over 43,569,000 million Americans living in poverty, the worst poverty rate since 1994 and in 2010 we had over 46,200,000 million and the worst povety rate since 1993. U.S. Census: Table A-1. Households by Total Money Income, Race, and Hispanic Origin of Householder: 1967 to 2009. U.S. Census: Table A-2. Households by Total Money Income, Race, and Hispanic Origin of Householder: 1967 to 2010. U.S. Census: Table A-1. Households by Total Money Income, Race, and Hispanic Origin of Householder: 1967 to 2009. U.S. Census: Table A-2. 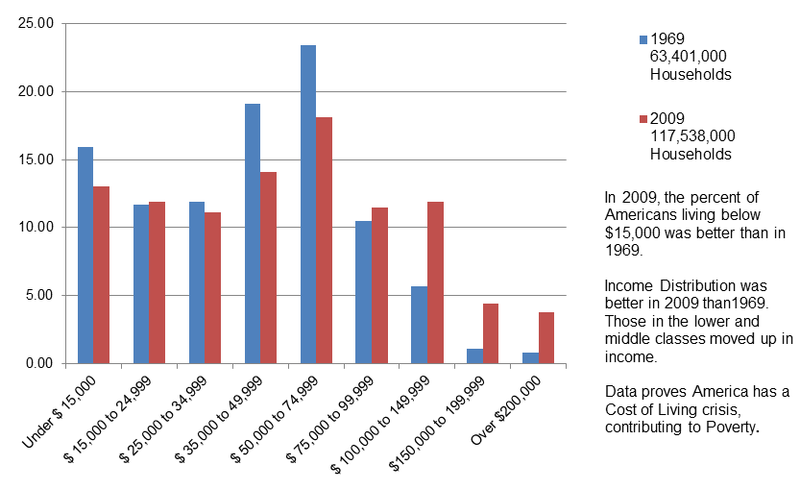 Households by Total Money Income, Race, and Hispanic Orgin of Householder: 1967 to 2010. In 2009 we had over 43,569,000 million Americans living in poverty, and in 2010 we had over 46,200,000 million Americans living in poverty the worst poverty rate since 1993. Tami predicts that in 2011 the poverty rate will reach record highs caused by the mismanagement of inflation and cost of living. The US Poverty Thresholds in 2010 remain extremely low, for example, if a person’s total money income was less than $ 11,344 they would be considered 'in poverty'; similarly if a family of four, with two children had total money income above $22,113 they would not be considered 'in poverty'. Without doubt, it denotes not merely freedom from bodily restraint, but also the right of the individual to contract, to engage in any of the common occupations of life, to acquire useful knowledge, to marry, establish a home and bring up children, to worship God according to the dictates of his own conscience, and generally to enjoy those privileges long recognized at common law as essential to the orderly pursuit of happiness by free men. Tami worries that the current CPI index, has not adequately monitored inflation. The index does not currently consider food or energy prices. Food prices began to escalate in early 2010; however, our leaders choose to ignore the condition as statistically irrelevant. If Republicans and Democrats had noticed the dramatic increase in prices, they could have cautioned Americans, especially those that live pay check to pay check. Now Americans have lost their homes, filed for bankruptcy, incurred debt, required food stamps and worry if Social Security and Medicare will be eliminated. Americans deserve better. Lastly, if cost of living continues to be ignored, poverty rates will increase and the overwhelming majority of Americans would sit with no disposable income. Americans should be told the truth, we have ﻿16 trillion dollars in debt, record low interest rates, high unemployment, and the majority of people have minimal assets to tax. Therefore the amount of options available to the Federal Reserve, President and Congress remain limited. The Federal Reserve Jan 2012 Consumer Credit Report shows "revolving credit decreased at an annual rate of 4-1/2 percent, while nonrevolving credit increased at an annual rate of 14-3/4 percent". This collective crisis has been a direct result of ﻿Oligarchy leadership - Americans need to acknowledge our country needs new leaders. ﻿Attached is my 2011 American Express to support my observations then conclusions. U.S. Census: Table B-1, B-2. 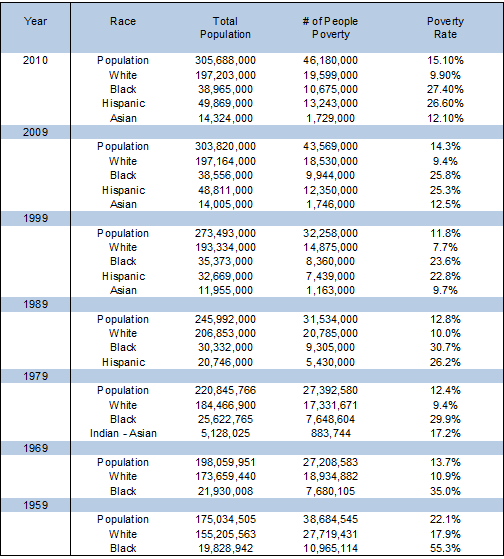 Poverty Status of People by Family Relationship, Race, and Hispanic Origin: 1959 to 2009; Annual Social and Economic Supplement Poverty 2009; Table 96. Poverty Status in 1979, 1969, and 1959 of Families and Persons by Race: 1960 to 1980;No. 753. Persons Below Poverty Level and Poverty Rate, by Definition of Income: 1989;Table 129. Poverty Status in 1979 of Families and Persons by Race: 1980; Poverty: 1999. In 2010 the lowest level of poverty based on nativity is the Naturalized Citizen 11.3% while those Native Born in the United States was 14.4%. U.S. Census: Table 4. People and Families in Poverty by Selected Characteristics: 2009 and 2010: pg 15. 2008 and 2009 and Table 708. Individuals and Families Below Poverty Level - Number and Rate by State: 2000 and 2008. 2009 Maps.